Duty to Maintain Property May Exist Even with Open and Obvious Dangerous Condition - В сложной финансовой ситуации приходит на помощь кредит наличными в Казахстане. Even with an open and obvious dangerous condition, there may still exist a duty to maintain the property and repair that same condition. In Middleton v. Don Asher & Associates, Inc., 44 Fla.L.Weekly D301d (Fla. 5th DCA 2019), the plaintiff was a unit owner in a condominium for 15 years. She slipped and fell while she was walking on the condominium’s premises. In particular, she slipped and fell on a sidewalk that contained uneven joints between two concrete segments. She sued her condominium association and property manager for negligence in a premise liability action. The sidewalk was apparently a common element required to be maintained by the association. 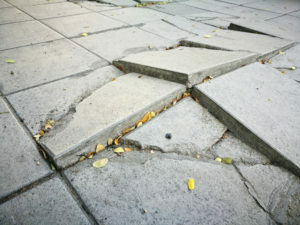 The condominium association and property manager filed a motion for summary judgment claiming that the plaintiff’s premise liability claim fails as a matter of law because the condition of the sidewalk was open and obvious and did not constitute a hidden, dangerous condition. The plaintiff countered that even if the condition was open an obvious, a fact issue remained whether the association and management company should have anticipated that condominium residents would use the sidewalk and, therefore, repair that condition. The trial court granted summary judgment holding that the condition of the sidewalk was open and obvious and did not constitute a hidden, dangerous condition. This was reversed on appeal. “[T]he duty owed to invitees is ‘1) to use ordinary care in keeping the premises in a reasonably safe condition, and 2) to give timely warning of latent or concealed perils which are known or should be known by the owner or occupier.’… The obvious danger doctrine recognizes that owners and occupiers should be legally permitted to assume that an invitee will perceive that which would be obvious upon the ordinary use of their own senses.” Middleton, supra (internal citations omitted). The plaintiff was an invitee as she lived in the condominium. There is law that finds that uneven floor levels are an open and obvious condition, so this did not appear to be a disputed issue. Yet, although this means an owner may not have a duty to warn others of the open and obvious condition, this does not discharge the owner’s duty to “maintain the property in a reasonable safe condition by repairing conditions that they foresee will cause harm.” Middleton, supra. Stated differently, the obviousness of a dangerous condition does not relieve an owner’s duty to repair that same condition. Here, if the property manager and association anticipated others would use the sidewalk and encounter the open and obvious condition, they still had a duty to maintain the sidewalk in a reasonably safe condition. If they could anticipate others would use the sidewalk with the open and obvious dangerous condition, then, naturally, it could be anticipated that others could be harmed by that condition. This does not mean that the plaintiff would not be found comparatively negligent for getting hurt on the open and obvious condition, it just means the association and property manager may have been negligent for not acting reasonably to maintain and repair the condition.